Every newborn needs a cute crochet hat and Huggabeans has all the cute styles you could want from holiday to sports-themes, animals and pom poms! 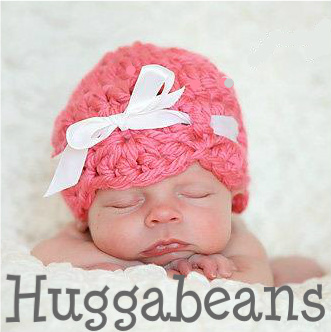 Huggabeans uses the softest variety of yarns and have all the colors you could ever want in your baby hats, complete with flower and bow embellishments…as needed. I love to gift Huggabeans hats for baby showers or as gifts for new arrivals, as they always make baby’s first photos picture perfect! Check out my two favorite guys in their newborn Huggabeans hats! And — Huggabeans made these oh SO CUTE crocheted crowns for my baby sprinkle too!